When you hear "Burgundy" you think first and foremost of good food and Burgundy wine. Well, this was not the main goal of our trip to the southern parts of this beautiful French territory. Following last year's trip to CERN this year the Museumsgesellschaft Freiburg followed a guide well known for her knowledge of cultural history. On our way to southern Burgundy and its Romanesque tympana we passed the Royal Salt Works at Arc-en-Senans. Approaching the Works I couldn't believe my eyes: The entrance was the Brandenburg Gate as it looked when Napoleon had robbed its quadriga in 1806. 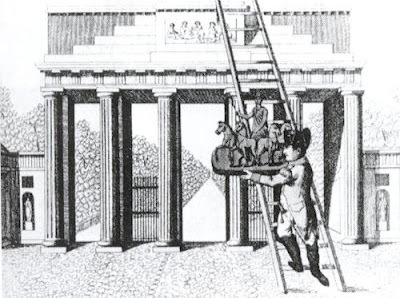 Let us get the timing right: Carl Gotthard Langhans planned and built the Brandenburg Gate in the years 1789 to 1791 basing its style on the Propylea entrance to Athen's Acropolis whilst Claude-Nicolas Ledoux constructed the first stage of the Royal Salt Works at Arc-et-Senans between 1775 and 1778 greatly influenced by Palladio’s works. Both architects built in the neoclassic style. So who copied whom? Ledoux’s idea was to attract men for the job of a salt simmerer (Salzsieder) by building their living quarters close to their place of work. The Royal Salt Works included the director's house that again shows those six columns. Salt was a precious preservative agent in the Middle Ages. One way to arrive at the dry product was to evaporate salt water. The job of a salt simmerer was hard work. Ledoux's plans however were only partly executed because the price of salt dropped so much that in 1895 all salt production was stopped at Arc-en-Senans. 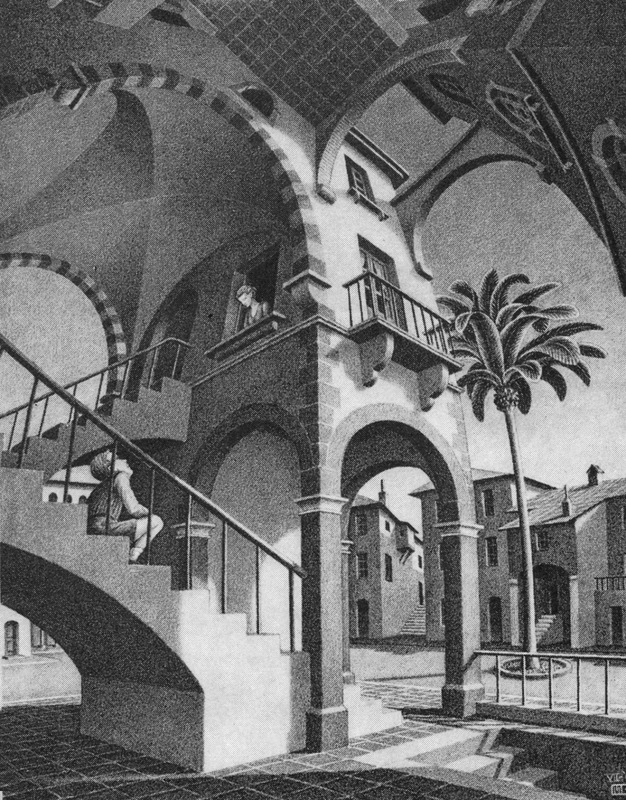 Only half a circle was finished with the houses and gardens of the workers around the circumference. The two columns were never started. Our next stop on our way to our hotel in Mâcon was the Church St. Philibert in Tournus. Built in the Romanesque style in the 12th century one of its spires carries a nicely decorated steepletop in the late Romanesque style. The height of the nave is nearly that of a Gothic cathedral. With cylinders penetrating each other the interior vault just looks disturbing. Immediately M.C. Escher’s dream constructions came to my mind. When our guide queried why the style of St. Philibert's was not copied elsewhere I thought that it was just too complicated to be build compared with the upcoming Gothic style. Did you notice what we experienced waiting for our dinner? The following morning we read the explantion in French above the entrance of our hotel. The next two days of our trip were devoted to visiting churches in southern Burgundy built in the Romanesque style. The first tympanon from the 12th century we studied in Paray-le-Monial but before that we visited the city's Basilica Sacre Coeur built in the beginning of the 12th century on the site of a 10th-century monastery. It is a small-scale version of the lost Abbey of Cluny. A detail built in the high Romanesque style. the impressive back of the church. The tympanon we admired in Paray-le-Monial had been transferred from the parish church in Anzy-le-Duc to the Musée du Hiéron (the Greek word hieros means holy). Christ the teacher sits in a mandorla with two cherubs supporting him. Tender and loving detail with Mary and baby Jesus looking like an adult. The following tympanon we found above the entrance to Ste-Marie-Madeleine (Mary Magdalene) at Neuilly-en-Donjon. It shows Jesus sitting on St. Mary's lap accepting the gifts of the three Magi. Below on the left hand side Eve is offering the famous apple to Adam who really is reluctant to take this sour one thinking about sweeter fruits behind him? And, behold, a woman in the city, which was a sinner, when she knew that Jesus sat at meal in the Pharisee's house, brought an alabaster box of ointment, and stood at his feet behind him weeping, and began to wash his feet with tears, and did wipe them with the hairs of her head, and kissed his feet, and anointed them with the ointment. There was a certain creditor which had two debtors: the one owed five hundred pence, and the other fifty. And when they had nothing to pay, he frankly forgave them both. Tell me therefore, which of them will love him most? Simon answered and said, I suppose that he, to whom he forgave most. And he said unto him, Thou hast rightly judged. And he turned to the woman, and said unto Simon, Seest thou this woman? I entered into thine house, thou gavest me no water for my feet: but she hath washed my feet with tears, and wiped them with the hairs of her head. Thou gavest me no kiss: but this woman since the time I came in hath not ceased to kiss my feet. My head with oil thou didst not anoint: but this woman hath anointed my feet with ointment. Wherefore I say unto thee, Her sins, which are many, are forgiven; for she loved much: but to whom little is forgiven, the same loveth little. And he said unto her, Thy sins are forgiven. And they that sat at meal with him began to say within themselves, Who is this that forgiveth sins also? And he said to the woman, Thy faith hath saved thee; go in peace. The little parish church in Monceaux-l'Etoile shows another of those talking medieval tympanons. The tympanum depicts Jesus' ascension in a mandorla with two cherubs helping with the lift-off. Among those watching Jesus with astonishment from below the person in the middle full of faith sticks out his long finger pointing to the Lord. Such a finger I had seen before. In the Isenheim altarpiece painted by Matthias Grünewald John the Baptist points his longish finger at the Lamb of God. 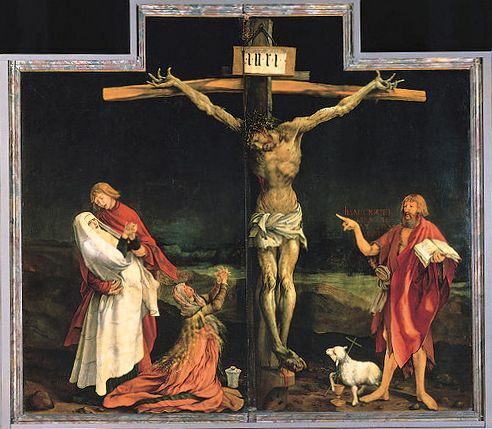 The Isenheim retable is on display at the Museum in Colmar near Freiburg. Last not least we visited St. Hilarius with its unusual octagonal steeple in Semur-en-Brionnais. The tympanon at the church shows Christ teaching the correct faith. Sitting in a mandorla he is surrounded by the four evangelists. In the lower part the tympanon from left to right tells the story of the church's patron. In 353, although still a married man, Hilary was unanimously elected bishop of Poitiers. At that time Arianism was threatening to take over the Western Church. Settling the disagreement between the Catholics and the heretics was a great task for Hilary. One of his first steps was to secure the excommunication of prominent Arians. However their supporters banished Hilary from Gaul. After four years in exile spent in Phrygia Hilary came back and extended his fight against Arianism into northern Italy. When Hilary impeached as a heretic Bishop Auxentius of Milan, a man high in the imperial favor, Auxentius fought back and Hilary fell into disgrace. It was all in vain. Bishop Auxentius was struck by a shameful death. Lacking sufficient bowel movement and constipated he pressed too hard and suffered a stroke, a medical phenomenon already known at the time. His soul is conventionally depicted as a small person escaping his mouth with the devil taking it immediately.